I don't really do reviews. I always worry that someone else will have used the same product, hated it and think I'm a moron who knows nothing about nails, or that I'll sound like a "holier than thou" head-girl type. Which believe me I am not. But this polish remover is good stuff, in my humble opinion, so I had to share it with you. I cam across it while quickly looking at the Collection 2000 stand in Tesco. I needed polish remover but had forgotten it, the kids were cranky, I wanted out of there and my other half had wandered off to look at something manly like meat or Old Spice or something, so I grabbed this (and a polish and foundation...) and ran before he noticed. Yes, it's Collection 2000. Yes, it's less than £1.50 a bottle. Yes, it does what it says on the tin! The claims it makes on the bottle that it "Cleanses, conditions and whitens nails" are true. It removes polish so easily and since I've been using it my nails have looked less stained. Of course, that may be down to my current penchant for pale colours, and my nails are never naked for longer than an hour so it doesn't matter, but I think this remover has something to do with it. It is acetone based, but my cuticles and skin haven't been dried out after using it, and I've not had random dry bits on my nails. I a, also finding it removes polish so well, even ones with lots of layers and thick lashings of seche. It struggles with glitter, but what doesn't? There are a couple of downsides - the bottle is fairly small (150ml). I want a bigger bottle! And also the cap doesn't seem to be leak-proof after you've opened it for the first time. But just don't lay it flat wherever you store it I guess. 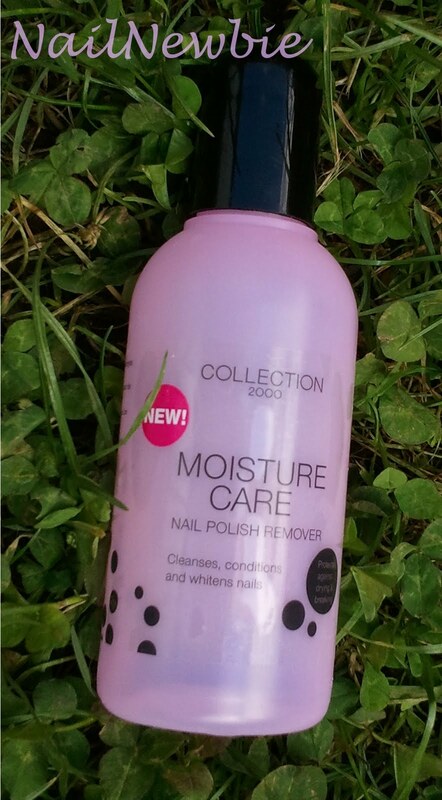 Other than that, if you're looking for a good basic polish remover than this is one to try! I'm on to my second bottle now - and I'm not usually a brand-loyal kind of girl. I am easily bought with promises of buy one get a free tree frog etc, but I'd happily pay full price for this. What polish remover do you use? Anyone tried pure acetone? I would like to try it, mainly for cleanup though I think as it can be very drying.